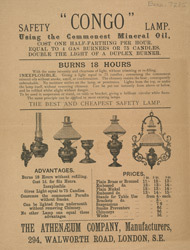 Up to the middle of the 19th century, most domestic lamps had used colza oil as fuel. A heavy oil, colza did not readily get drawn up a lamp's wick, and as a result the light it produced was weak and prone to go out. Paraffin was a much lighter oil, producing a more stable flame. Patented in 1850, paraffin is a form of processed petroleum. It was initially expensive and used only in the industrial environment. The discovery of oil wells in Pennsylvania, America in the 1870s led to the mass refinement of crude oil, and the mass production of paraffin. The price fell and by the end of the century paraffin was perhaps the most popular means of illuminating the household.